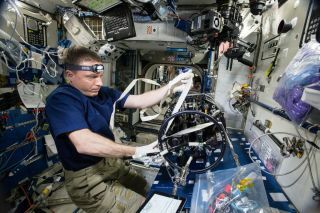 NASA astronaut Terry Virts prepares a microgravity experiment aboard the International Space Station. A new open- access journal is dedicated to publishing research covering spaceflight and analogue research. The same organization that publishes Nature, a prestigious journal that commonly reports major space discoveries, has launched a new journal devoted to microgravity research. Called npj Microgravity, the new open-access journal is available online and is now looking for submissions. The journal is being published as a collaboration between the Nature Publishing Group and the Biodesign Institute at Arizona State University, with the support of NASA, according to a statement on the new journal's website. "Microgravity" is the environment that astronauts experience in space; for example, when they are orbiting Earth, they are "falling" at the same rate as their spacecraft, which makes them feel weightless. Microgravity can also be experienced in short bursts, such as on the famous "Vomit Comet" airplane that flies parabolas up and down, or on minutes-long sounding-rocket flights. Experiments on human health have shown that living with reduced gravity is hard on human bones and muscles — a finding that has implications for future space exploration. In recent years, it has been identified as an environment where new types of materials can be processed, such as mixed molten metal that has multiple densities. The International Space Station is the most consistent microgravity environment used today. There are often dozens of experiments being conducted on board the orbiting laboratory. The astronauts on board the station serve as subjects for further studies on how microgravity affects human health. With a new 3D printer on board, the station is also a mini-manufacturing test facility. The "npj" in the journal's name refers to Nature Partner Journals, a series of online-only journals that are freely available for anyone to access. npj Microgravity will "follow a modified version of Nature's editorial standards," according to the website. Cheryl Nickerson, who studies biomechanical forces on living cells at Arizona State University, will serve as the journal's editor in chief. "Each partnership in the Nature Partner Journals series brings together strong editorial leadership with world-class publication systems to deliver high-quality, peer-reviewed, original research to the global scientific community," says a statement on the Nature Partner Journals website. Nature Publishing Group has announced several new journals in recent days. Other titles include Nature Energy, Nature Microbiology, Nature Reviews Materials and npj Regenerative Medicine.